Galle’s first vases, dating from 1878, were made of transparent glass on which an outline design was drawn in brown with a brush. 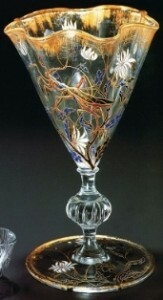 The vase was then given to an enameller to fill in the outline with enamel colors, sometimes leaving the brown outlines visible, after which the vase was refired at low temperature to enable the enamel to vitrify. The colors used were red, opaque green and turquoise, white blue and gold. He later widened his palette to include a wide variety of colors and shades. The very first designs based on eighteenth century French faience, Bohemian glass or Japanese models, enamel-painted in a single color with a little landscape, continuous scene or bit of plat, soon gave way to freer floral or plant designs. The example of Joseph Brocard tempted him to essay Islamic patterns, frequently covering the whole surface with enamel.